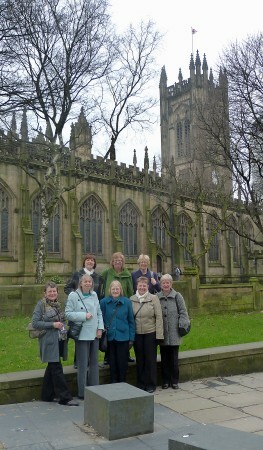 By Carol: The day commenced with nine of us catching the train and then the tram for a visit to Manchester Cathedral where we had a very entertaining and informative guide who told us some of the history about the Cathedral, in particular that the stained glass windows had been severely damaged in the Blitz in 1940 and again in the IRA bomb in June 1996. Many have been replaced by plain glass and the others with modern stained glass. The oak carvings were fantastic and we were told they were some of the best in the world. It is well worth a visit. Lunch was very good in the Cathedral café and later we went to Chetham’s for the lunchtime concert where an extremely talented 15 or 16 year old student performed his violin repertoire without music for 45 minutes. We all agreed that it was a most enjoyable day. A group of members visited Hopton Hall on the 22nd February. 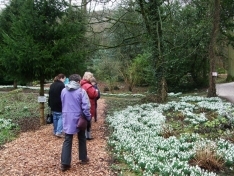 Not put off by the rain we wrapped up against the elements and thoroughly enjoyed our walk through the carpet of beautiful snowdrops. We agreed that it was such a lovely spot that it would be worth visiting again in the Summer when the roses are in bloom. If the weather is favourable we could bring a picnic to share.